WINCHESTER, IN, April 6, 2018 – Hoosier Energy Rural Electric Cooperative, Inc. and EDP Renewables (EDPR) have executed a power purchase agreement (PPA) that will bring the 200 MW Riverstart Solar Park to Indiana’s Randolph County. The solar park is expected to be operational in 2022 and will be the largest solar array in the state, producing enough clean electricity to power approximately 37,000 households. The project will also bring economic benefits to the region and to the state of Indiana in the form of jobs, landowner and tax payments, and money spent in local communities. DES MOINES – Central Iowa Power Cooperative (CIPCO) announced development of the Heartland Divide Wind Farm, a major project to expand its wind energy platform, set for completion by the end of this year. CIPCO will purchase 100 percent of the output from the 104 MW facility owned by an affiliate of NextEra Energy Resources, adding to its already diverse energy portfolio, which is more than 60 percent carbon-free. NRCO assisted CIPCO with the PPA review. Arkansas Electric Cooperative Corporation (AECC) has announced it will buy up to 100MWac from a 800-acre solar farm near Crossett Arkansas. AECC, a cooperatively owned Generation & Transmission (G&T) entity has entered into a Power Purchase Agreement (PPA) with Renewable Energy Systems Inc. (RES) to purchase solar power from Crossett Solar Energy Farm starting in 2021. National Renewable Cooperative Organization(NRCO) helped AECC fine tune language in a solar PPA provided by NRCO. The addition of the solar PPA will raise AECC’s renewable portfolio to 17% of their total generation. NRCO assisted AECC with the RFP development and contract review. Wabash Valley Power’s member co-ops will benefit from recently completed long-term agreements to purchase the energy and capacity generated by what will be the largest solar arrays ever built in Illinois. Wabash Valley Power will be the sole buyer of the energy produced from two 99-megawatt (MW) arrays to be built by New York-based Ranger Power, a utility-scale solar development company. Wabash Valley Power will purchase the power produced by the arrays, while the renewable energy credits (RECs) associated with the projects will be sold through the Illinois Power Agency REC procurement process. Johnson Corner Solar AnnouncementMid-Kansas Electric Company Inc., along with its sister company Sunflower Electric Power Corporation, announced its plan to purchase renewable energy from a 20-megawatt solar project scheduled for construction in southwest Kansas. The cooperatively operated wholesale generation and transmission utility has signed a 25-year power purchase agreement with Lightsource BP, an independent power producer that will build, own and operate the solar facility. 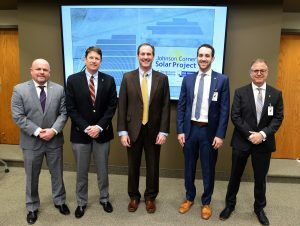 The National Renewable Cooperative Organization, with its member-owner Mid-Kansas, jointly developed the project and sourced Lightsource BP as Mid-Kansas’ long-term partner. 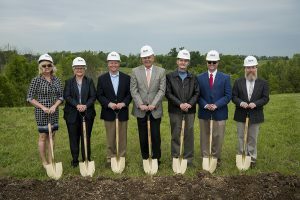 Kansas Lieutenant Governor Tracey Mann joined representatives from Mid-Kansas, Lightsource BP, and NRCO to announce the project on February 27, 2018. Johnson Corner Solar Project announcement Feb. 27, 2018, at the headquarters of Mid-Kansas Electric Company, Inc., and Sunflower Electric in Hays, Kansas. From left to right: Steve Epperson, chairman of the Mid-Kansas Board of Directors; Stuart Lowry, president and CEO of Mid-Kansas and Sunflower Electric Power Corp.; Kansas Lt. Gov. Tracey Mann; Eric Spigelman, National Renewables Cooperative Organization director of renewables development; Kevin Christy, Lightsource BP, North America, chief operations officer. MARYVILLE, Missouri – Tenaska, one of the leading independent power producers in the United States, has signed a long-term power purchase agreement (PPA) with Associated Electric Cooperative Inc. (Associated) with a capacity of approximately 236 megawatts (MW) of renewable power from a wind project in northwest Missouri. The Tenaska Clear Creek Energy Center project, currently in advanced development, is located near Maryville in Nodaway County. Under the terms of the 25-year PPA that was announced Monday at an event at Northwest Missouri State University, the project is anticipated to be operational in 2020. Renewable Energy Systems (RES) is pleased to announce that construction has begun on the Hog Creek Wind Project located in Hardin County, OH. The National Renewables Cooperative Organization (NRCO) facilitated the 20-year power purchase agreement with Southern Maryland Electric Cooperative (SMECO). Hog Creek Wind Project will be a 66-MW project comprised of 30 Vestas V110 2.2-MW turbines. The project, owned by EDP Renewables (EDPR), is on schedule to be operational before the end of 2017. “Once again, NRCO has assisted SMECO with procuring wind energy to help the cooperative meet state requirements. As we add more and more renewable energy to our power portfolio, we demonstrate our commitment to environmental stewardship,” said Jeff Shaw, SMECO Vice President of Distributed Energy and Sustainability. In the summer of 2016, the National Renewables Cooperative Organization (NRCO) released a Request for Proposals on behalf of Southern Maryland Electric Cooperative (SMECO) for solar energy supply. This process culminated in a Power Purchase Agreement award to Origis Energy USA for the 27.5 MWAC Ripley Solar project. NRCO Member EKPC has begun construction on a 60-acre, 32,300 panel solar farm near their headquarters in Clark County, KY. The cooperative will be offering a community solar program off of this 10 MW-dc solar site. Interested customers should inquire here. The full press release can be found on EKPC’s website, here. From left to right, Allyson Honaker, Julie Tucker, Todd Barling, David Crews, Jeff Brandt, David Samford, Fernie Williams. Photo by Tim Webb. HATTIESBURG, Miss. – May 23, 2017 – Hattiesburg-based Cooperative Energy and Origis Energy USA began construction in May on a 52MW solar energy facility, which will provide clean energy to the generation and transmission cooperative’s 423,000 members across Mississippi. Origis Energy has developed and will install and operate the electric generation site, and Cooperative Energy will purchase all power produced at the location. The 540-acre solar site is located near Sumrall in Lamar County. The site will encompass 206,892 photovoltaic solar panels when completed in December 2017. The project will create approximately 400 jobs during construction.